Why Join RESA, your Professional Trade Association? Belonging to a trade association is a sure way to boost the reputation of your business. Because RESA is a non-profit organization held to bylaws, a board of directors and membership, our association is truly driven by members and leaders of the organization. RESA is growing its presence through various channels such as connecting with local real estate associations, making connections at various Markets, reaching out to WCR chapters, and providing publication tools to elevate the industry it serves. RESA members must adhere to a Code of Ethics. A strong COE protects the consumer as well as our members. RESA takes pride in standards and the COE helps reinforce a level of expectation. Being involved with RESA opens many opportunities for leadership and networking. There are nearly fifty local chapters of RESA in the US and Canada and one hundred sixty leaders planning monthly business resource meetings focused on professional development. Local chapters generate exposure for home staging at the local level by participating in charity events, local trade shows, offering presentations and educational classes. RESA membership has grown to be the largest network of professional stagers dedicated to advancing professionalism and excellence in your industry! RESA Leaders represent our constituency and collectively serve to hold our organization accountable in accordance with the RESA Mission. RESA partners with the 'best of the best' in home staging training. Our training providers are huge fans of RESA members and we strongly encourage stagers to refer to a RESA Training Provider for core training. RESA offers monthly webinars specifically designed for additional support to new home stagers. This is over $400.00 in savings on education with your RESA membership! RESA hosts monthly virtual events with guest speakers focused on professional development. These events are always educational and a great substitute for members who do not have a local chapter nearby, or in addition to monthly chapter meetings. This is over $500.00 in FREE education with your RESA membership. 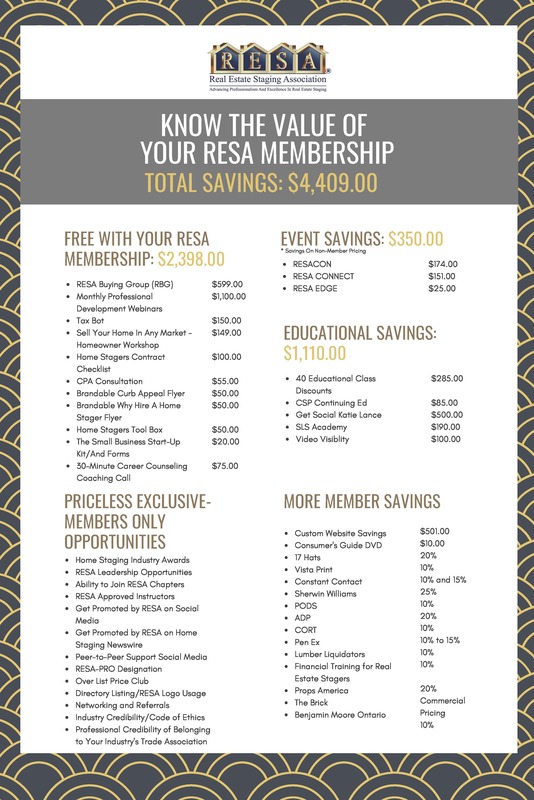 Over $900 in instant savings with your RESA membership! RESA has been focused on Real Estate Agent Outreach Programs through social media and through several local real estate associations. RESA is the real estate industry's largest network of MCE Staging Instructors offering "Staging to Sell, What Every Agent Should Know", a proprietary designation class that can only be taught through RESA, by RESA Approved Instructors. As a bonus, some states offer MCE Credits. Each year RESA hosts the industry's largest home staging convention, RESACON. We had a record-breaking attendance at RESACON 2017 and already slated to sell out an even larger event in 2018. RESA members receive preferred pricing for RESACON. RESACON always includes a diverse line-up of speakers and are carefully selected to ensure attendees will learn new strategies, no matter where you are in your business, to catapult your business to the next level. The RESA Home Staging Industry Awards are held each year at RESACON. The industry's top home stagers showcase their craft and are recognized for their transformational abilities. This is the industry's most prestigious awards celebrating the finest professionals in leadership, home staging and redesign categories. If you want to see the best, this is the place to be! HQ has grown it's staffing to better serve the growing membership and focus on industry related issues within the staging & real estate communities. RESA has greatly increased social media presence, and are committed to inspirational and educational content with more ways to feature members too! Members have access to exclusive deals offered by various vendors. RESA has recently been especially focused on connecting with wholesalers at Market and educating about stager's buying power! RESA members have benefited from our newest VIP partners such as Surya and Ashley Furniture and the list of resources continue to grow. RESA provides various tools to support member needs and has a large network of resources to tap into for business support services. Need a Website? Save $501.00 on Website Design RESA makes the process of having an incredible website super easy. We know that having a great website is critically important. When you are first starting out having an affordable beautifully designed website will ensure you stand out.